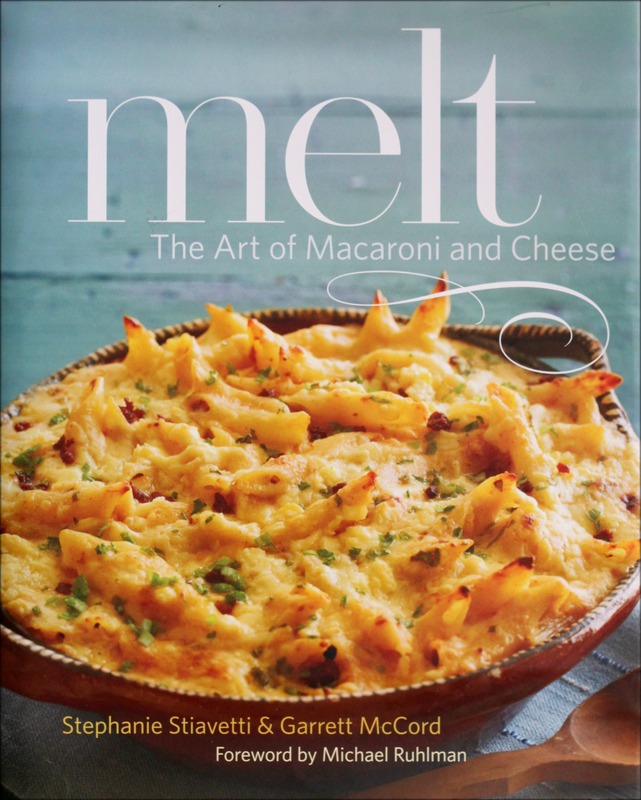 Christmas came early this year when I was asked to review a new cookbook, Melt: The Art of Macaroni and Cheese. Co-authored by writers Stephanie Stiavetti and Garrett McCord, Melt is an exhaustive celebration and imaginative re-creation of the beloved mac ‘n cheese. Embracing the childhood classic as a point of departure, the authors run with it, elevating and reinventing the tried-and-true combo in more than 75 original recipes which weave through the seasons, numerous cuisines and a veritable glossary of cheese. To top it off, the recipes are brought to vivid life by the delectable photography of Matt Armendariz. You will want to eat this book. Whether you consider yourself a traditionalist (Tuna Noodle Casserole), an experimentalist (Chocolate Pasta with Bucheron, Hazelnuts and Cherries), or a lover of far flung cuisines (Pastitisio with Kefalotyri Cheese and Lamb), there is something in this book for everyone. And while at times the definition of macaroni and cheese is stretched to its limits, that’s all part of the fun you will have with this book – with rich and gooey results. Which brings me to the cheese. While I am a pasta fan, this book is the proverbial candy store for cheese lovers like me. It’s packed with resources and tips, from shopping to storing to shredding techniques, with cheese from every provenance and milk-bearing animal finding its way onto the ingredients lists. This might help to explain the generous quantities of cheese assigned to each recipe – this is a very cheesy mac and cheese book. So be prepared to fork out a bit of moolah in the dairy department – and reconsider canceling that gym membership for now. It’s all worth it. 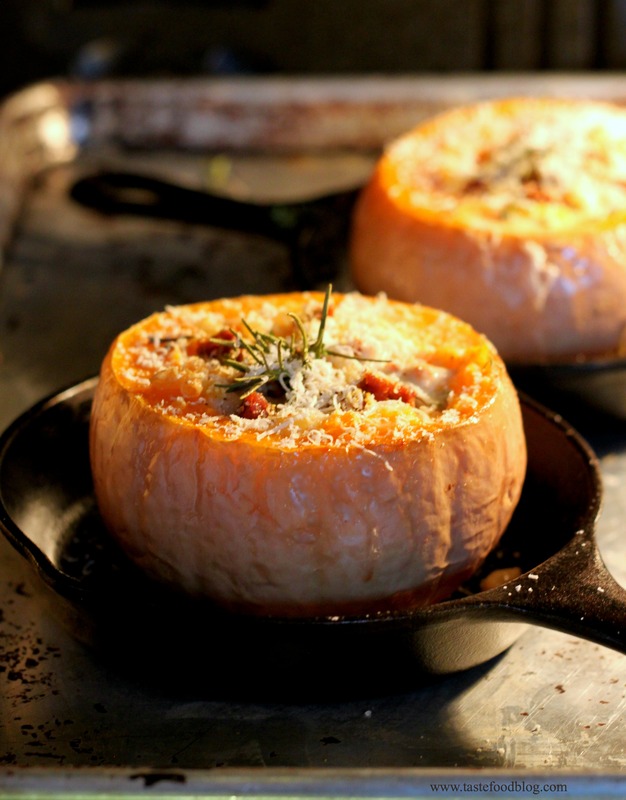 In their book Melt, Stiavetti and McCord prepare this recipe in a large sweet pumpkin. In this adaptation I have substituted butternut squash for the pumpkin and chorizo sausage for the mild Italian sausage. For the cheese I used all Gruyere in the filling and then sprinkled the tops with grated Parmesan. The amount of cream has been reduced, because the squash cavities are smaller than the pumpkin. Adapted from Melt: The Art of Macaroni and Cheese, by Stephanie Stiavetti and Garrett McCord. Recipe courtesy of Little, Brown and Company. Cut off the narrow necks of the squash, leaving about a 3-inch base, and save the necks for another use. Scoop out the seeds and strings from the base. Season the flesh with salt and pepper. Place cut-side down in an oiled baking dish. Bake until tender, about 45 minutes. Heat the oil in a skillet over medium heat. Add the sausage and cook until golden brown. Transfer the sausage with a slotted spoon to a large bowl cool and discard the drippings. Bring a large pot of salted water to a rolling boil. Add the pasta and cook until just shy of al dente, about 1 minute less than package instructions; drain and cool slightly. Add the Gruyere, rosemary, thyme, and sage to the sausage. Add the pasta and stir to combine. Fill the centers of the squash with the pasta mixture. Carefully pour approximately 1/4 cup cream into the centers of each squash without overfilling (the cream will bubble up as it cooks). Place the squash in a baking dish or on a rimmed baking tray. Bake until the filling is bubbly and the squash is tender, 20 to 30 minutes. Remove from oven and turn on the broiler. Sprinkle with parmesan and broil until golden, 1 to 2 minutes. Garnish with fresh rosemary, thyme or sage. Serves 6. Oh my gosh, I think I’m in love with that squash and the book. Chorizo, cheese, squash, all fantastic. If it was recommended by Michael Ruhlman then it means the book’s good! I love the mere idea of stretching mac and cheese to the outer limits! And I am definitely in the cheese lover category — I could go without meat, as long as there was cheese! This book is on my Christmas wish list! The title of the book is swoon worthy! How can you resist “Melt”? What a tempting fall recipe for such an enticing new cookbook! Yay! Thank you for the kind review! Love the butternut/chorizo combo! A great sounding book and wonderful dish! I love the idea of stuffing a butternut squash with mac & cheese. WOW…super tasty and so beautiful too. Gotta start running more miles if I’m going to eat all this cheese….and I AM.